The growing city of Roanoke sits in the northern area of the DFW metroplex and serves as the perfect setting to live for many reasons. 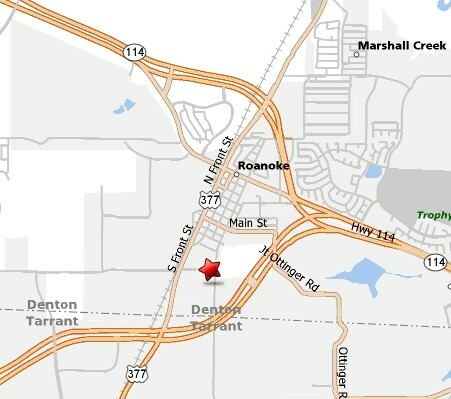 Conveniently located at Highway 114 and 377, Roanoke’s optimal location provides ideal access to many amenities the Dallas-Fort Worth area has to offer. Despite the rise of urban development, Roanoke is known for its rich history and the historic downtown area of this town provides timeless enjoyment. Named offers over 40 restaurants, many events and festivals, shopping, as well as live music. Not only does Roanoke exceed expectations on being the Unique Dining Capital of Texas, they provide many parks and trails for running and biking. Roanoke also offers an exceptional educational system, in the Northwest Independent School District, that is among the best in the state of Texas.